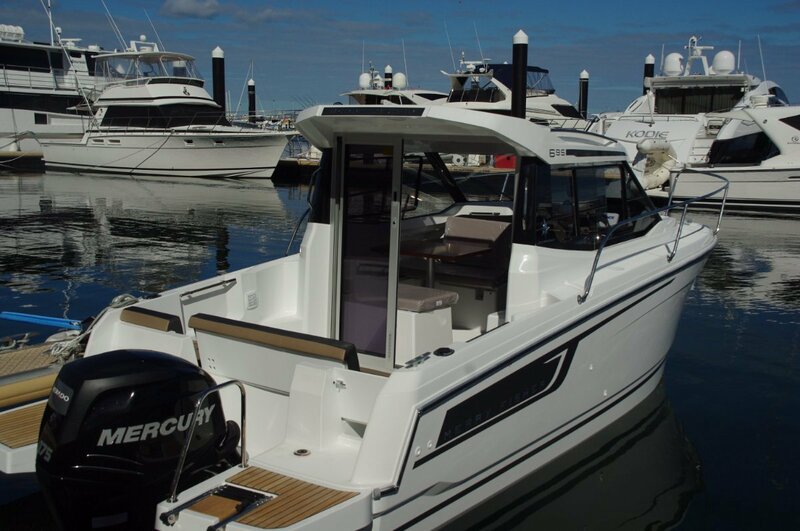 Jeanneau called this series of boats Merry Fisher. You could cast a line from the 695, but perhaps a name suggesting something about weekending and raising the odd glass would be closer to the boat’s real intent. Jeanneau is a huge producer of boats in Europe. Just this one model has a sale every day somewhere in the world; over 700 of them sold so far. It is a manufactured product, engineered for production in bulk and to standards of maximum efficiency. Every boat is of identical quality. Because of the quest to reduce labour content every component that can be moulded is. This means an easily maintained boat because all visible surfaces are gel coated. The self draining (unusual in this size of fibreglass boat) cockpit seats up to five in a clever upholstered arrangement across the transom. Fully assembled it forms a settee. To give room for tilting the motor the centre section slides forward. To use the door onto the starboard boarding platform, that section of seat is removable. Multiple options can add more seats and a table. There is useable deck space left over, part of it forming a hatch revealing tanks and batteries. The cabin is reached from the cockpit via a three piece lockable sliding glass door. Glass dominates the cabin. There are deep side windows that slide, a curved one piece windscreen with a pair of wipers, and a sliding skylight with a shade. The driver gets a classy swivel bolster seat mounted above a locker to starboard. Aft of him is officially the galley: a double sink above more lockers. In Europe a single burner stove can be specified to replace half the sinks. For Australia commonsense says most people would prefer a cockpit mounted barbecue. The dinette to port incorporates volume to accept a fridge and a design that converts into a double berth. Mid cabin floor lifts to reveal lots of storage space; an obvious location for the wine cellar. It is worth mentioning that this area has standing headroom for six footers. The fore cabin has room for V-berths to suit those same people. An infill converts them into a big double, and there is a space here that can take an optional toilet – either chemical or holding tank. This cabin has a clear fore hatch giving access to the anchoring equipment, although side deck access is also good. The trick of giving the main cabin good width and yet leaving a decent side deck is solved by offsetting the cabin to make the starboard deck much wider than the port. In Australian style anchoring has been given some importance. With a large lidded bin and a substantial bowsprit. There is enough room in the bin for an optional electric windlass. Although la dolce vita is emphasized, French style, other active pursuits are more than possible. The boarding platforms cantilever a long way aft (having a sideline in protecting the motor) and would make good spots for anglers to slouch at anchor. The port platform even has a small wet locker. Within easy reach of either platform is a rod holder. And, of course, the same facilities apply to divers and swimmers. 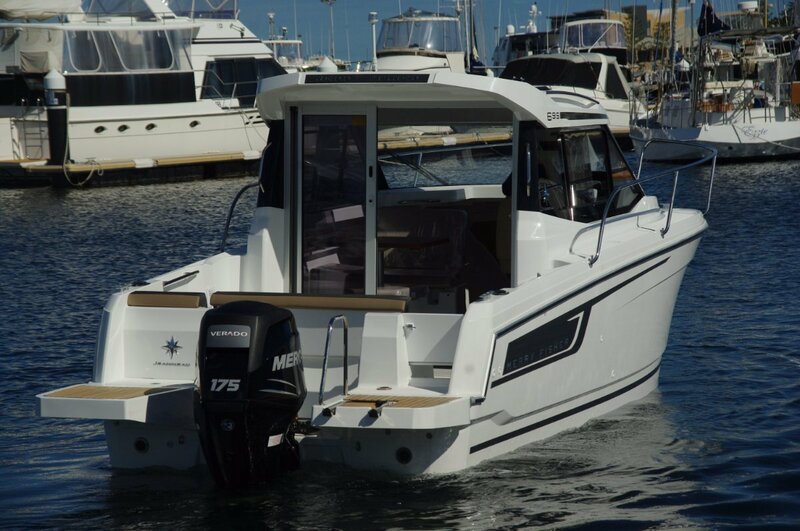 The 695 is rated to take 175hp and that is what our boat had, delivered by a Mercury four-stroke. It was good for a little over 30 knots, which makes for an effortless low 20s cruising speed. This is not by any measure a sporty boat, and it made no sense push it hard; a boat equipped with crockery, bottles, glasses and the like would expect a different sort of career. 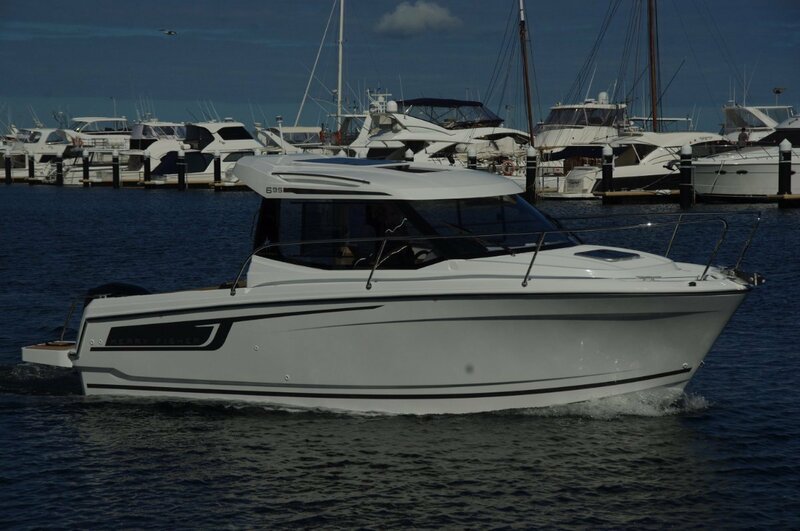 This is not a genuine cruising boat, but is unquestionably capable of handling long weekends with four on board. It must be one of the cheapest on the market that fits that description: its base price is $99,300. 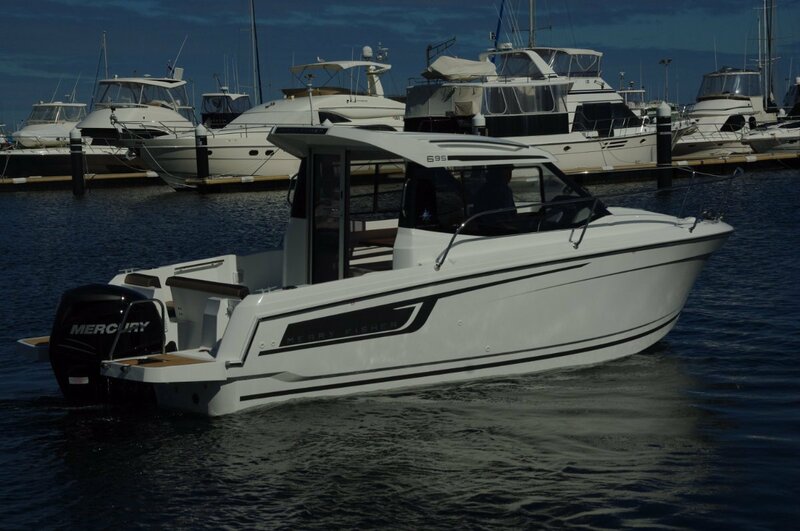 Add on the desirables - barbecue, windlass, deck shower, toilet, plotter-sounder, fridge and so on – and it should still come in under $110,000. No trailer in that list, although weighing in at under two tonnes, towing is certainly possible. It seems much more in the 695’s style, though, to keep it in rack storage and let somebody else do the launching and recovery.